For those of you who have writing skills, it would be nice to participate in a writing competition with theme "Hikayat Kotaku" (saga of my city) and make your dream have a book.
" The winner will get coaching money, trophies and certificates, as well as additional appreciation by publishing the winner's book"
How and where to register? Don't worry, you can see at bit.ly/JWFHikayatKotaku. It is open for public. 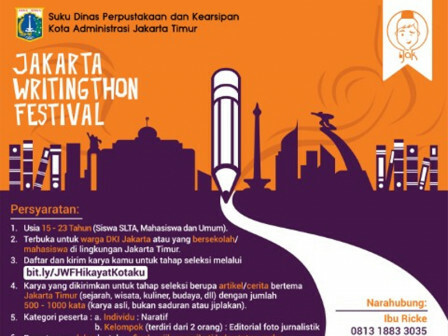 East Jakarta Library and Archives Sub-agency Head, Eka Nuretika Putra said that the competition packaged in the form of the Jakarta Writingthon Festival is held to support civilization of reading interest and literacy promotion. This is just not a competition, but creative writing training. "The winner will get coaching money, trophies and certificates, as well as additional appreciation by publishing the winner's book," she stressed, Friday (3/29). It is more to the theme of the historical, tourist, cultural, culinary, etc. Writing requirements is between 500 to 1,000 words. For individual participants is in the form of narrative works. "Then group participants (two people) are in the form of journalistic photo editorials," she said.